Bicycle-sharing programs are fairly common in large European cities, but will it work in Palo Alto, Mountain View, and San Jose when one comes here in March? 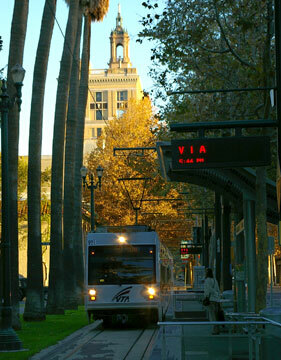 According to a story in the San Jose Mercury News, the Valley Transportation Authority received a $500,000 grant from the Metropolitan Transportation Commission. Details are not final but, according to the story, riders will carry a card that can be swiped to unlock a bike at the Diridon Caltrain, Mountain View, or Palo Alto station. How much will it cost? How long can the bike be checked out? We don’t know. There will be 100 bikes per station. Another item that needs to be resolved is maintenance. Nearby bike shops will do the work or perhaps some other arrangement will be made, because bikes need maintenance over time. While we don’t know what kind of bikes will be available, it’s obviously going to be something practical. Look for fenders, a basket, wide, flat-resistant tires, lights. Caltrain has seen a lack of cars equipped to carry bikes. However, more cars have been added. Will there be enough demand for these bikes? A lot depends on the cost and how long the bikes can be kept. The main issue is availability. If you rely on these bikes to get to work from the train station, you want to know one will always be available. With plans for 100 bikes, I don’t think that will be a problem. I would be concerned about vandalism, so the bikes should be kept in a locker or a cage. This entry was posted on January 10, 2010 at 7:58 pm and is filed under News. You can follow any responses to this entry through the RSS 2.0 feed. You can leave a response, or trackback from your own site.